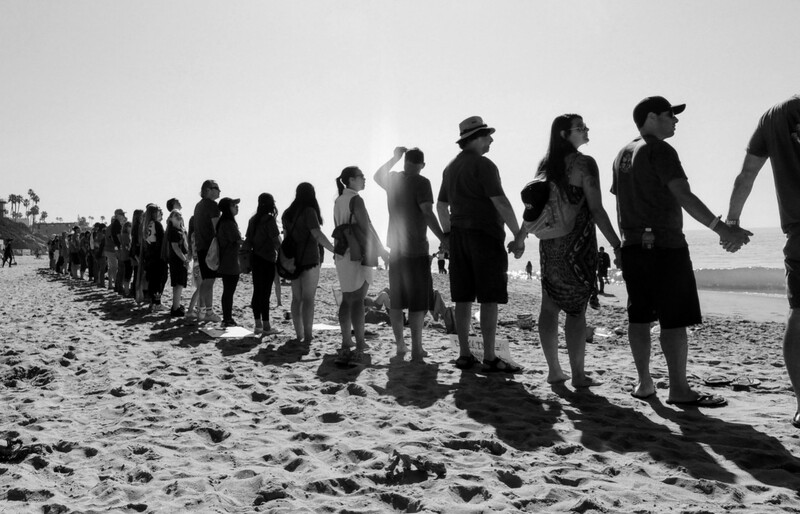 Thousands of Californians attended coastal protests on February 3rd against the Trump administration’s plans for new offshore drilling. Next up is the official public meeting on February 8th in Sacramento. 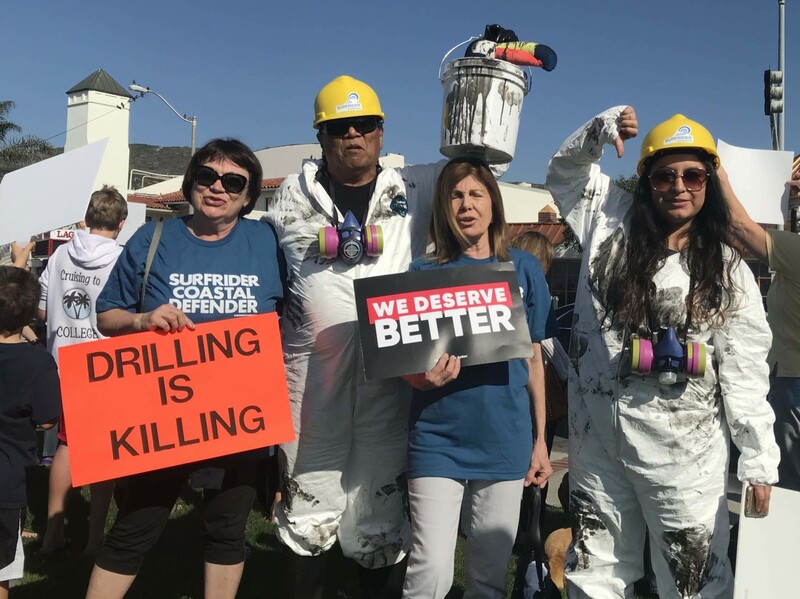 What do you do when the federal government proposes new offshore drilling along the entire California coastline, but schedules only one California public meeting in Sacramento? You rally citizens to attend protests in the communities most affected by this dangerous proposal! 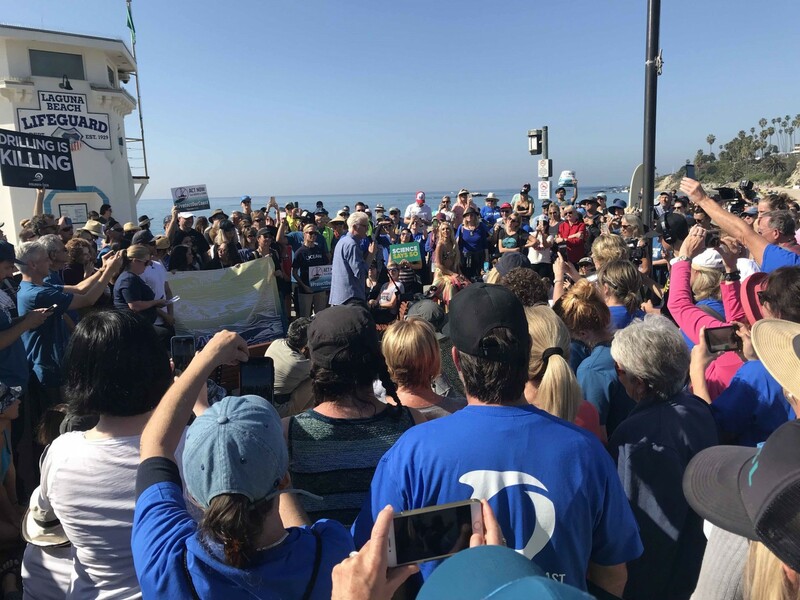 On February 3rd, Surfrider chapters partnered with dozens of other groups to organize coastal protests in San Diego, Laguna Beach, Los Angeles, Ventura, San Luis Obispo, and Santa Cruz. 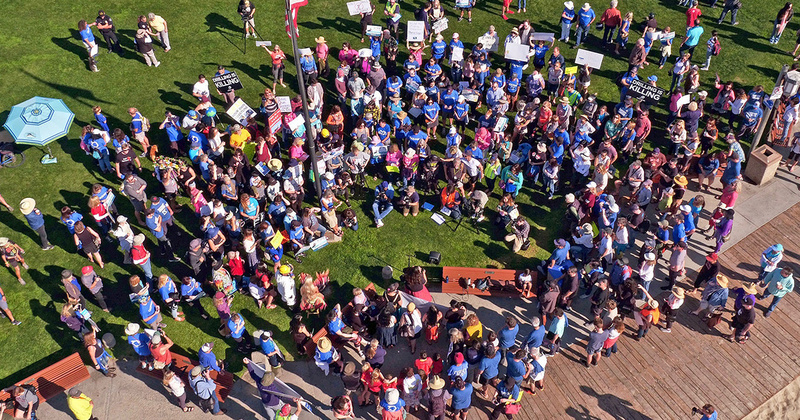 The rallies were timed in advance of the February 8th public meeting in Sacramento and designed to spotlight the voice of Californians unable to travel to the state capital for the agency hosted listening session. In Laguna Beach, over 500 people turned out to hear Ted Danson, U.S. Congressman Alan Lowenthal (CA-47), Surfrider CEO Dr. Chad Nelsen and others speak out against oil drilling off California. The event was organized by Surfrider’s South Orange County, Newport Beach and Huntington/Seal Beach chapters along with NRDC, OC Coastkeeper, Oceana, Sierra Club Angeles Chapter, Indivisible OC 48 in the ancestral homelands of the Acjachemen Nation with Sacred Places Institute for Indigenous Peoples. On Jan 4, 2018 the Trump Administration released a draft plan proposing opening almost the entire U.S. coasts to new oil and gas drilling. Interior Secretary Ryan Zinke outlined in his proposal to open areas of the California coast that have been off-limits for over two decades. This offshore drilling free-for-all is a clear example of politics over people, ignoring widespread local and state opposition... and is a recipe for disaster. The Trump administration's proposal to expand offshore oil development is being met with unyielding opposition in California, where drilling in coastal waters has been deeply unpopular since a devastating 1969 spill off the coast of Santa Barbara which spewed more than 3 million gallons of oil into some of the nation's most sensitive coastal habitat, killing thousands of seabirds and other marine life and spurring the modern environmental movement. The Bureau of Ocean & Energy Management (BOEM) has scheduled ONLY ONE PUBLIC MEETING in the state on February 8 in Sacramento, far away from the coastline where the general public and our vital CA coastal economy would be affected by the impacts of offshore oil drilling. As a member of the Protect the Pacific coalition, Surfrider is urging coastal advocates who can attend the February 8th public meeting in Sacramento to RSVP here and the Facebook event page. Surfrider also urges everyone to submit comments to BOEM before the March 9th deadline. See sample talking points and make your voice heard today!